Cancer Biology: The Return of Cancer...Thanks to Surgery? Surgical removal of a tumor has been called the "cornerstone of treatment" for many cancers. In the case of breast cancer, women may choose to undergo partial or total mastectomies (the removal of one or both breasts) in order to completely remove the cancerous cells from the body. Such surgery dramatically increases survival rates for the majority of patients; however, recent research has shown a peak in reoccurring malignancies in patients who undergo surgery. For example, a study preformed by the British Journal of Cancer in 2001 showed that survival was much greater in breast cancer patients who decided to have surgery. However, eight years later, those same patients had a higher risk of reoccurring metastasis than their counterparts who did not treat their cancer with surgery. The medical journal Annals of Surgery published an article in 2009 claiming that surgery created an "environment" within the body that made it easier for cancer cells to metastasize. Evidence for this theory was gathered from an examination of fluids that drained from the surgical sites. In these fluids, there was found to be various mitogenic factors normally associated with the wound healing process. Within these, scientist also found mitogenic factors that have been known to trigger breast cancer proliferation. In light of this discovery, further research has uncovered various mechanisms of how surgery induced cancer metastasis. The first of these mechanisms involves cancer cell adhesion. In order to form tumors, cancer cells must attach to one another and do so through cancer cell adhesion. When tissue is exposed to a surgical environment, this adhesive ability increases. Another mechanism profits off the fact that after surgery, a woman's immune system is compromised, and the ability of white blood cells to seek out and destroy cancer cells is diminished. Because of this, cancer cells find it easier to metastasize, evade death, and spread throughout the body. A third mechanism involves angiogenesis. The primary tumor releases anti-angiogenic factors that actually prevent metastasis, and with the removal of this tumor comes to removal of these factors. In addition, synthesis of VEGF, or vascular endothelial growth factor also occurs post surgery; this growth factor is often a stimulator of tumor angiogenesis. A fourth and final mechanism of surgery induced metastisis is through the inflammation caused by surgery. Surgery causes inflammation at the surgical site, producing certain chemicals that trigger the activity of an enzyme called COX-2. This enzyme has been known to influence cancer cell growth as well as metastasis. 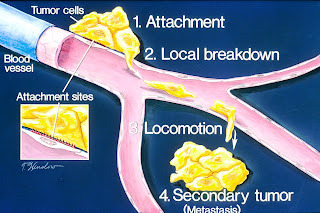 metastasis is cell adhesion, shown in Step 1, and this is greatly increased in a post-surgery patient. While surgery can increase cancer cell adhesion, angigenesis, and inflammation while suppressing immune function, it is and should still be considered a successful means of treating breast cancer. However, in light of this new research, doctors are proposing that surgery be followed by close inspection as well as a number of different treatments that will battle the possible negative consequences of surgery.